Kinetic Die Casting uses computer-aided production control to manufacture and ship die casting parts to our customers. 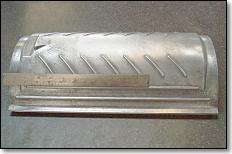 We manufacture parts and ship the parts to our customers on time. We will usually manufacture and ship products in four weeks from the time the order is placed. We can expedite some die cast manufacturing product shipments in less then two weeks. Our die cast machine sizes range from 130 tons to 600 tons in our aluminum and zinc die casting machines. 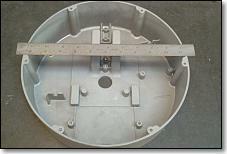 We make many types of die casting parts from less than an ounce up to a ten pound shot. Aluminum Die Castings, Aluminum Heatsinks, Aluminum Die Cast Handtools, Medical Lighting Die Cast Products, Die Cast Security System Card Reader and Keypad Housings, Commercial Lighting Die Cast Parts, Professional Camera Die Cast Parts, 413 Aluminum Die Cast Aircraft Parts, 383 Aluminum Die Cast Automotive Parts, Swimming Pool Accessories, Candy Machine Zinc Coin Mechanisms, Medical Product Accessories, Wheelchair Lift Parts, Housing Products, Cable System Parts, Aluminum Heatsinks, Die Cast Speaker Driver Housings, Home Builders Hardware Die Cast Castings, Commercial Tape Backup Die Cast Parts, Commercial Aluminum Sensor System Die Cast Products. Learn more about our manufacturing capabilities by looking at our die cast part sizes & die cast production manufacturing capabilities. 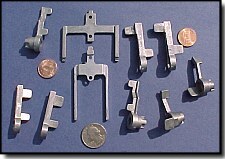 Die cast parts of many types and sizes from .001 pound to 10 pounds aluminum and zinc. Die Casting Manufactured Part pictures. Another advantage at Kinetic Die Casting is our production and quality personnel, who dedicate themselves to manufacturing the best die cast quality parts on time.